In this avatar Lord Vishnu incarnates himself as a human, a human who acts without reasons and has uncontrollable anger. King Kaartaveerya-Arjuna ruled the area around where Jamadagni and his family lived. One day King Kaartaveerya-Arjuna and his troops ventured out on an expedition in the forest. Half way through the expedition they realised that they have run out of all water and food. They were all hungry and tired. Thankfully they came across a small beautiful house - this was Jamadagni’s house. They ask Jamadagni if they could get some food and water to drink. Jamadagni kindly agreed and he and his wife were good hosts. They prepared an elaborate meal for the King and his troops. The food was very delicious. The king was very impressed and asked the secret behind such a delicious meal. Jamadagni says that the entire credit goes to his divine cow, Kamadhenu. This cow has the power to make confer any favour instantly. The king got a bit jealous and greedy and demanded that the cow be given to him. Jamadagni refused. And so the king took the cow away forcibly. Parashurama was away when this incident happened. On his arrival he learned of the King’s actions…He was furious…He took his axe and went straight to the palace….No one was able to stop him….He went straight to the king and beheaded him. When the king’s sons found out about their father’s murder, they went straight to Jamadagni’s house - looking for Parshuram. Parshuram was not in the house….Only his parents were in the house - The princes’ killed Jamadagni. When Parshurama returns home, he finds his father dead and his mum crying. He is heart broken. As usual the fit anger of takes over him…He grabs his axe and rushes to the palace and kills all the princes…He is disappointed at all the unfit kings. Kings are supposed to their subjects and not kill them. So he goes on to kill 21 unfit kings - He thinks he has done a favour to the entire world by killing these Kings. Parashurama was obviously a very disturbed person…I understand that some of the kings were unfit - But killing them the way Parashurama did is not the answer. Parashurama is the incarnation of Lord Vishnu….But his actions are very different to what a divine person would do - Maybe Lord Vishnu is showing us the ugly side of a human and maybe He wants us all to find God even in bad people. Parashurama then goes to Himalayas and spends years praying and meditating. At the end of the prayers, he is blessed by Lord Shiva and he becomes a much saner person. 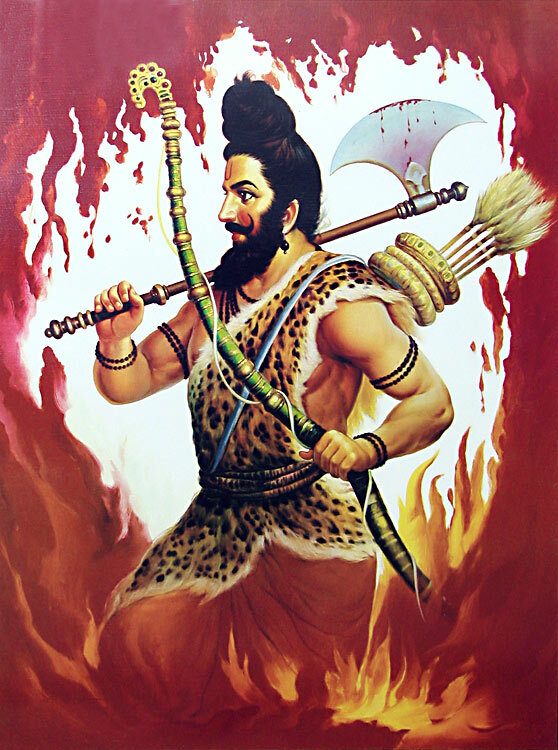 Parashurama is a Chiranjeevan or an immortal and will continue to dwell on earth until the last avatar of Lord Vishnu. He even makes an appearance in Ramayan and Mahabharat.